What I love about the gluten-free trend is it has brought more grains and flours to our fingertips. I’ve got red, black, brown jasmine and brown basmati rice in my pantry along with amaranth, millet, bulgur, farro, freekeh and a rainbow of quinoa. Grain choices don’t stop there I discovered poking around the bulk bins of PCC Market where I scooped up hulless barley, oat groats and wheat berries. 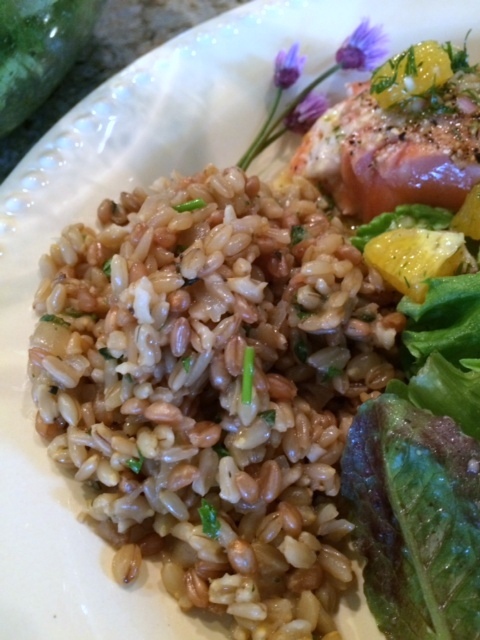 These whole grains offer deep earthy flavor and toothsome chew that refined grains can’t match. And they become almost addictive when cooked risotto style with a good douse of white wine, onion and garlic. Lemon zest and a medley of chopped fresh herbs usher the dish into springtime. Since the herbs in my northwest herb garden are just getting established, I snipped several types to season the dish and garnished it with pink chive blossoms. 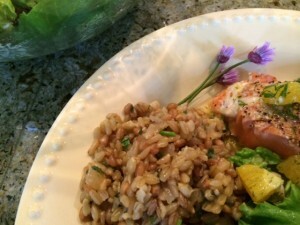 Fresh salmon is in markets and the photo shows the risotto with rich king salmon topped with a bergamot orange vinaigrette – a tasty pairing. All three grains are essentially intact whole kernels. The term groat (as in oat groats) is synonymous with kernel. Wheat berries are just that – the whole kernel of wheat, frequently available in hard red, hard white and soft white varieties and sought by people who grind wheat at home to make flour for baking. Unlike pearl barley, hulless barley is a whole grain because it is minimally processed to remove the inedible hull, leaving most of the bran, germ and endosperm intact. (Reference 2). Since hulless barley takes over an hour to cook, soak it for an hour or precook it for 30 minutes while assembling the other ingredients. Start the risotto before you prepare the rest of your meal because these grains needed a leisurely 50 minutes or so to soften. Nutrition: As pointed out by the Whole Grains Council (Reference1), a sizeable body of research shows that eating whole instead of refined grains lowers the risk of chronic diseases such as stroke, type II diabetes and heart disease and can help with weight maintenance. There is also evidence that whole grains may be associated with healthier blood pressure, and lower risk of asthma, inflammatory conditions and colorectal cancer. When you include multiple grains in your cooking you get a greater complement of vitamins, minerals and phytochemicals. Click on Reference 3 to link to an interesting chart from the Whole Grains Council showing the nutrients common whole grains. 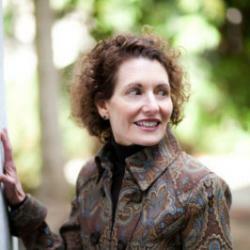 How much whole grain do you need? The U.S. Dietary Guidelines 2010 recommends making half your grains whole so for most people that’s about 3 servings per day. 1. Cover barley with boiling water and set aside for 1 hour. Drain. (Or, pre-cook by simmering in a small saucepan for 30 minutes. Drain.) Set aside. 2. Heat a large deep saucepan over medium-low to medium heat. Swirl in oil. Add onion and garlic. Cook, stirring often, till onion is soft. 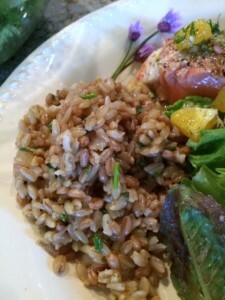 Add wheat berries and oat groats. Cook for 3 to 4 minutes, stirring often, until golden and toasted. Add wine and pre-cooked barley. Adjust heat as needed and simmer until almost dry. Add just enough chicken broth just to cover grains. Continue to cook, adding broth as needed, until grains are tender but pleasantly chewy, about 50 minutes. If grains are cooked but broth remains, simmer till reduced by not dry. Remove from heat and stir in zest and herbs. Taste and add salt and pepper to taste, as desired. Pass cheese to serve. Makes 6 to 8 servings.